Andrew won the medium qualifier at Patchetts today with over 68% to complete their qualification for the Winter Regional's. 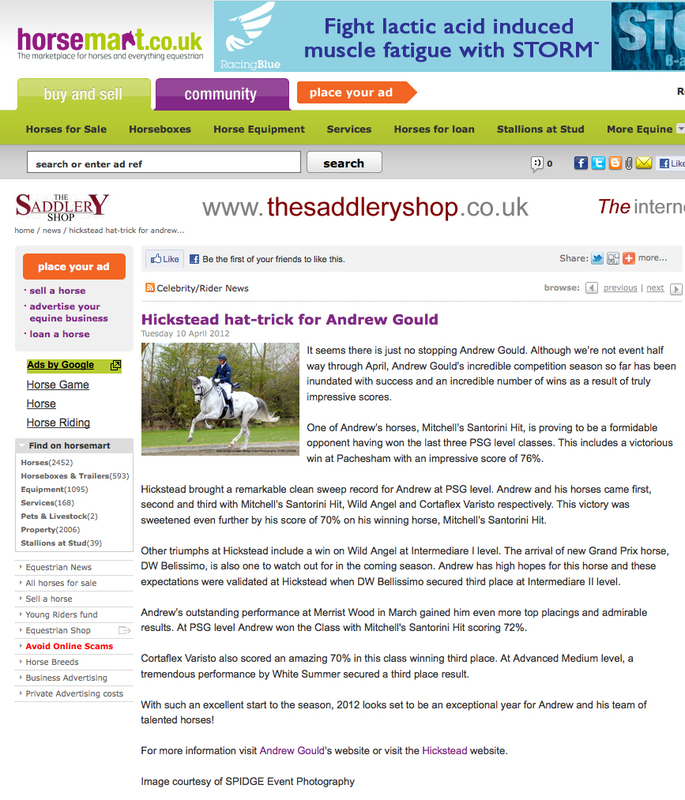 The combination also went on to win the medium music qualifier with an impressive 71%. 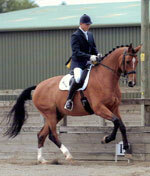 Wild Angel is owned by Mandy and Andrew Crouch and is by Donnerschlag out of a Rhodiamant mare. 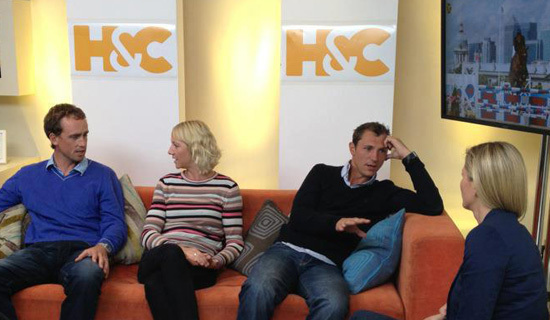 Andrew said, "I was really pleased with her today as there was a lot happening and a lot for her to take in. This was only her third show and so far we have been unbeaten. 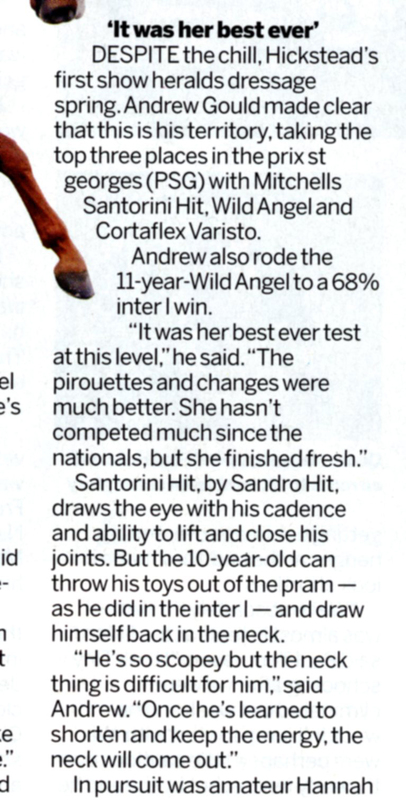 I am going to push on with her advanced work now and hope to make our Advanced Medium debut by the end of the year". 24th September 2008. Bolney, West Sussex. 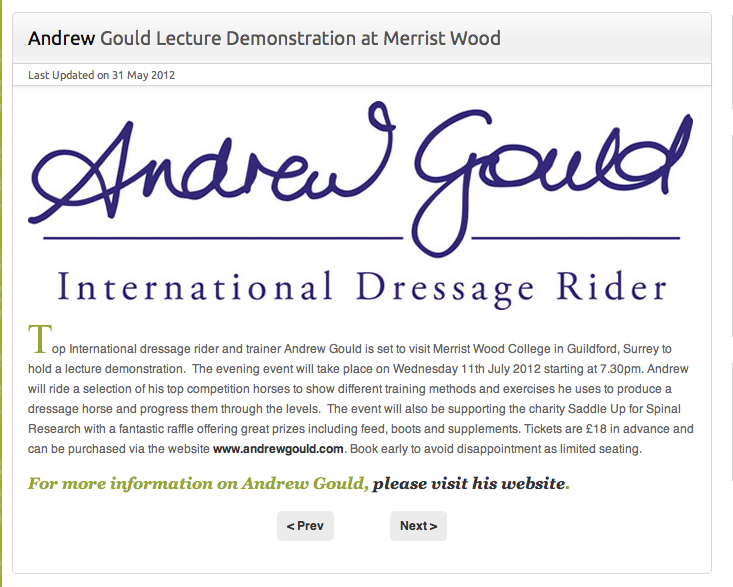 Top International dressage rider Andrew Gould is set to visit the Priory Equestrian Centre in Frensham, Surrey to hold an afternoon lecture/demonstration. The one-off lecture will take place on Sunday 9th November and is being run by the Newlands Corner Riding Club. 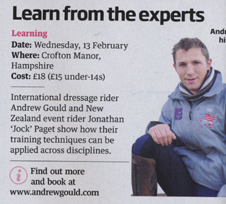 Andrew will be bringing both young and more experienced horses and will be demonstrating his training techniques and the process he works through in progressing them through the levels. The demonstration will start at 2pm and will finish at approximately 4pm. Spectators are advised to bring their own chair and refreshments for the afternoon. Tickets cost just �15 per person and must be purchased in advance. 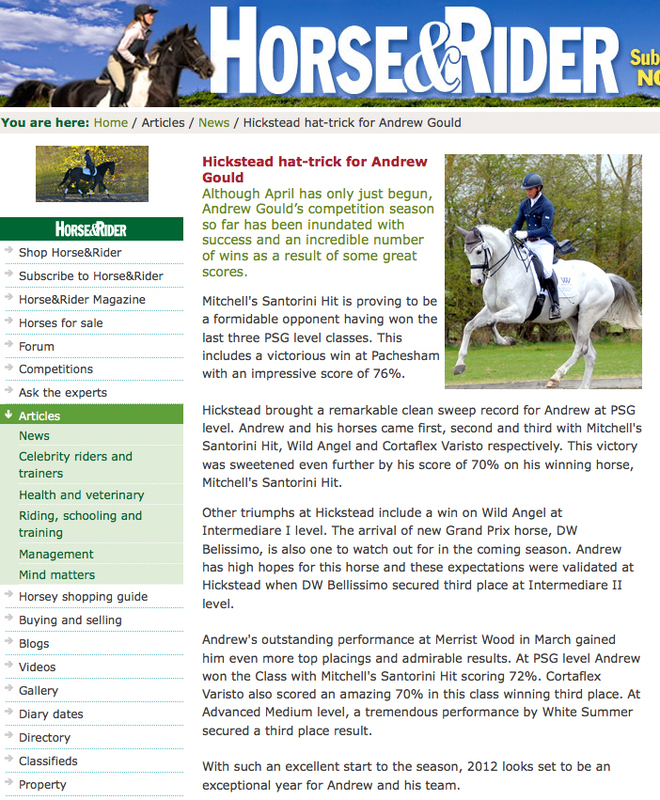 Please send a self-addressed envelope and cheque made payable to �Newlands Corner Riding Club� to Sue Davis, Tangley Mead, Great Tangley Manor, Wonersh, Surrey, GU5 0PT. For more information please phone Sue on 01483 567648. 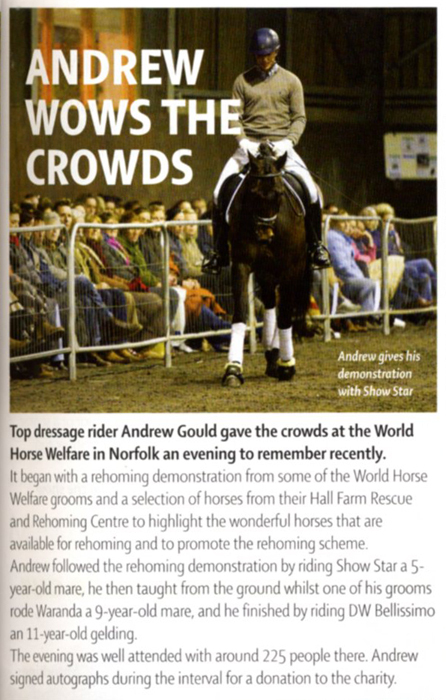 Support one of British Dressage�s most popular young riders! Andrew won the Elementary Open class at Ardingly on the 10th September riding Sara Green's Korenbloem Quercus G. This was the horse�s second win in the last few weeks and despite a brisk day Quercus behaved impeccably. "I feel that he is much more established in his balance and I will look to move him up to Medium level shortly and see if I can qualify him for the Winters. However my ultimate aim with this horse is Grand Prix and his training at home is very important at the moment." Andrew went on to win the Medium Open Qualifier riding Mandy and Andrew Crouch's Wild Angel. The young mare has only been at Andrew's yard for a couple of months, but already they are developing a great partnership. "I love this little mare. She has such an engine yet is so light and elegant. She has only been lightly competed so she is still gaining her trust and confidence, but I think this is a very talented horse and I really enjoy riding her". Andrew will be campaigning Wild Angel again at the end of the month to try and secure his full qualification for the Winter Regional Championship. Young Event rider, Emily Llewellyn has been selected to compete in the Young Rider European Championships in Germany later this month. 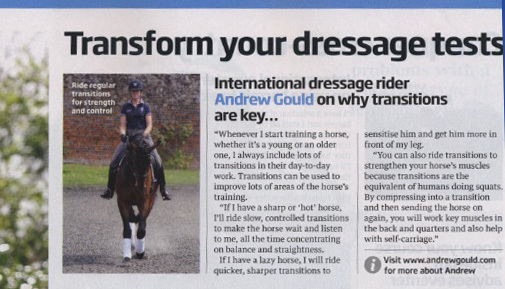 Andrew has been working with Emily on her dressage and is absolutely delighted for her. Korenbloem Quercus G owned by Sara Green had a convincing win to take the Elementary class at Hickstead on Saturday 30th August. 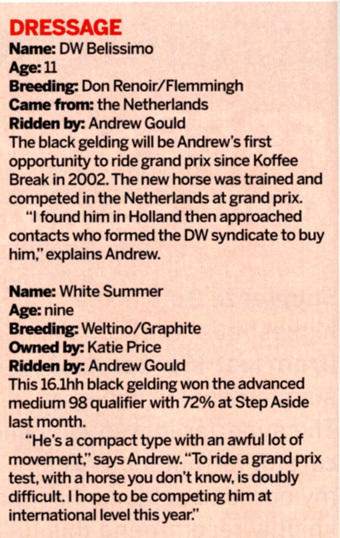 He scored an impressive 71% and Andrew was delighted with his test. "He is showing much more maturity and confidence and I have been working hard on his strength and balance over the summer. I am very excited about him for the future." International Event Rider Emily Llewellyn has successfully made the GB Young Rider European Event Team having won the final selection trial on her dressage score. Emily who has been training with Andrew over the past few months along with her sister will be heading off to Germany later this month. Andrew wishes her lots of luck and hopes she brings back a medal.